Boombod 7-Day Achiever is a weight management product that’s intended to provide dieters with a “quick and tasty way to lose weight without feeling hungry”. It’s basically a blackcurrant-flavoured powder that has to be mixed with water and consumed as a drink. It should be capable of providing the promised appetite decreasing effect because each one-shot sachet of Boombod 7-Day Achiever provides 1000mg of glucomannan and it’s known to be an appetite suppressant that works. However, Boombod 7-Day Achiever is a very expensive product to use. A 28-day supply of sachets costs well in excess of $120/ £100. There are many diet pills on the market that can provide dieters with the same amount of glucomannan at a fraction of the price. The company responsible for bringing Boombod 7-Day Achiever to market make it sound like a superior option by stating it provides other benefits too, but, apart from the astronomical price, the only difference between this and the countless other glucomannan-providing supplements is the presence of a few added vitamins and minerals, some colourants, and a flavour provider. If you are looking for an appetite suppressant we recommend PhenQ. 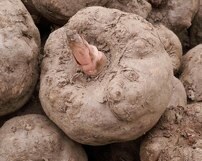 Glucomannan is a water-soluble fibre obtained from the roots of a species of Asian plant (konjac). Most supplement manufactures use it in pill-type weigh loss aids and it works best when it’s consumed with two glasses of water. Water causes glucomannan to expand rapidly and the resulting gelatinous compound fills up the stomach, making it feel full. Glucomannan’s ability to do this has been explored by experts from the European Food Safety Authority (EFSA) and they confirm three (1000mg) doses of glucomannan per day can support weight loss, but only when taken before meals and used as part of a calorie-controlled diet. The makers of Boombod 7-Day Achiever try to make it look more attractive than other glucomannan options by providing the glucomannan as a shot-glass drink instead of a pill, and each of the three doses per day contains a slightly different blend of vitamins and minerals. Morning Energizer: Promises to provide “energy-yielding metabolism”. Afternoon Motivator: Contains vitamins and minerals chosen to fight tiredness and fatigue. Night Rejuvenator: Intended to help provide healthy skin and hair. How to Use – Morning Energizer has to be taken 30 minutes before breakfast, Afternoon Motivator is taken 30 minutes before lunch, and the Night Rejuvenator shot needs to be knocked back 30 minutes before dinner. It’s just a case of finding a shot-type glass, adding the contents of the correct sachet, and stirring in enough water to fill the glass until it’s 25 percent full. Customers are told to drink it fast and follow-up with a second glass of water. As you can see from looking at the table of ingredients, all three formulations contain the same sweeteners and acidity regulators. The only difference is in the variety of vitamins and minerals. The glucomannan content should be capable of suppressing the appetite, but anyone following the usage instructions provided is likely to follow the shot of Boombod 7-Day Achiever with another shot-sized glass of water. A much bigger glass would be required to fully hydrate the glucomannan fibres and allow them to do their work. The morning energizer shot is unlikely to have anyone bouncing off the walls, but Vitamin B6 (energy drink ingredient) helps provide the body with energy by assisting the extraction of calories from food. However, if the shot has suppressed the appetite sufficiently, the first meal of the day may not have that much energy to provide. The pre-lunch shot does not contain anything that is likely to provide the promised motivation, but it pairs Vitamin B6 with another popular energy drink ingredient, Vitamin B12. The pre-dinner shot contains biotin, and it’s known to be good for the skin, hair and nails; so this shot may do the things it’s supposed to do. The problems is, with the exception of glucomannan, no inclusion rates are provided. If the amounts are insufficient benefits are unlikely. If they are too high, the formulations may cause side effects. The formulation contains a number of vitamins and minerals, acidity regulators and other ingredients in unspecified amounts; so side effects and unexpected interactions cannot be ruled out. We suggest only using this product if your doctor has confirmed it is safe for you to do so. 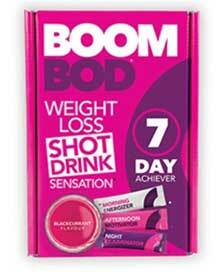 If you live in the UK, you can buy Boombod 7-Day Achiever from Holland & Barrett. If you reside elsewhere in the world such as USA or Canada, you will need to order it from the Boombod website and its called “7-Day Achiever” for a reason. Each pack only contains a 7-day supply of sachets (21 in total) and the cost per pack is so high, it would be cheaper to buy one of the leading diet pill brands. All of which are capable of offering dieters a greater level of support. Boombod 7-Day Achiever should have value as an appetite suppressant, but we question if the average user will use the product with a sufficient amount of water, and the fact that the formulations contain so many other ingredients in unspecified amounts creates a cause for concern. The lack of a money back guarantee also fails to impress. Suffice it to say, there are better options available.